Ninety nine years ago today, thousands of mine workers from Michigan’s Copper Country went out on strike, paralyzing the region’s mines and inaugurating one of the era’s most important labor conflicts. The strike lasted more than 9 months and was fought between an inter-ethnic group of workers and huge corporations like Calumet and Hecla. 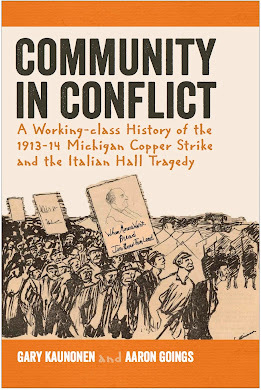 The Copper Country’s labor history in the years leading up to the strike was the topic of a talk entitled “Class Conflict in the Copper Country” by Aaron Goings on July 17 at Michigan Tech’s Van Pelt Library. Goings explored the “long history” of the region’s labor movement from its early formation among members of the Knights of Labor through the organization of dozens of trade unions during the early 20th century. He also discussed the influence of the Industrial Workers of the World (IWW or Wobblies), among the region’s workers. The talk concluded with Goings discussing the similarities between the 1913-1914 Copper Country Strike and contemporary labor conflicts. He also highlighted the strike’s significance to Progressive Era unionists and radicals. Around 75 people turned out to hear Goings’ presentation. The talk, as well as Goings’ visit to the Copper Country, was made possible through a travel grant from the Friends of the Van Pelt Library.